The Stats situation: Club Stats snapshot after this weekend's matches. New Ifield v New Ash Green - Away, following tradition New Ash Green lost the toss and were put in to bat. After some early wickets and drama (see full report when it happens) K Poole (22) & P Summer (15) got some runs on the board. However it was the nine lives of N Delaffon (90*) supported by C Hoddinott (20) that formed the backbone of New Ash Green's challenging total of 181-7 off the 40 overs. Initially New Ifield held out well, but with regular openers J Nash (0-31) & I Mellor (1-47) building pressure and A Gleeson (4-54) & Delaffon (3-22) capitalising on it, they ran out of overs 13 runs short and New Ash Green have bounced back from last week. New Ash Green v Beckenham V - Winning the coin flip, Vice Captain C Whittern chose to field. M Gallagher (0-26) joined F Quantrill (2-14) in opening the bowling and the latter picking up 2 early wickets, they kept the run rate in reasonable check. As usual change bowlers E Quantrill (2-43) & M Syed (2-51) also got involved in the wickets and Beckenham's innings of 151-7 wasn't overly threatening. M Granville, new to Beckenham this season was their top scorer on 34*. After tea, C Whittern was joined in the 3rd over by G Poole and they set about knocking off some runs. The opposition rang the changes through their bowling line up aiming to unseat them. Without much success, until the 20th over when their skipper brought on M Granville, who bowled a wicket maiden taking out Whittern (28). 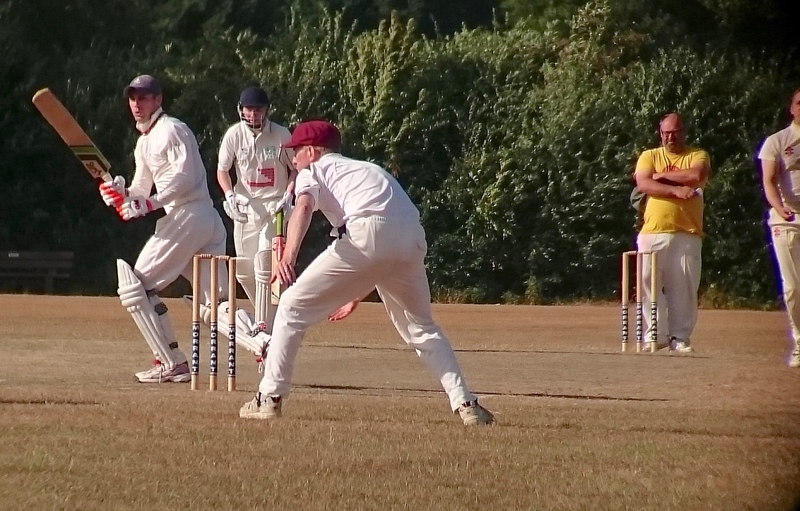 When you run into a guy having a good day... Whilst Poole continued to add to the scoreboard lasting 30 overs for 44, the remaining batsmen of New Ash Green fell to the increasing confidence of M Granville. The home tail resisted valiantly, edging the runs closer to the target but the Granville (8-32) claimed the last wicket in the 38th over, leaving Gallagher stranded 4* with New Ash Green 6 runs short. A frustrating defeat, but with both New Ash Green sides underpressure as the start of the holiday season and injury reduced numbers, one that the team can certainly bounce back from. 2nd XI chasing runs. For more club photos check out our gallery & also our instagram.